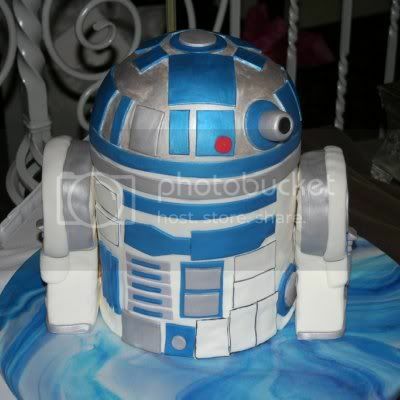 In my mind, the cake version of a diminutive service droid would have crunchy insides. Not so, here. This R2-D2 groom’s cake featured white cake with a coconut creme center and fondant detailing. So what sort of folks request an R2-D2 cake at their wedding ceremony? Well, Shannon and her husband, that’s who. Shannon’s a loyal fangirl of Hitchhiker’s Guide to the Galaxy, and her husband is a “HUGE” Star Wars fan. (Oh, yeah? Let’s see the permanent body art to prove it, fella.) During the post-ceremony recessional from the wedding altar, Shannon–gem of a bride that she is–surprised her hubby with the playing of “The Imperial March” (Darth Vader’s theme). Nothing says, “Look out, world, the unholy union of two dark souls was made here today,” like the sounding of “The Imperial March” after a couple exchanges their vows. I love it. Holly, cake artisan and friend to the couple, shares their sense of humor. 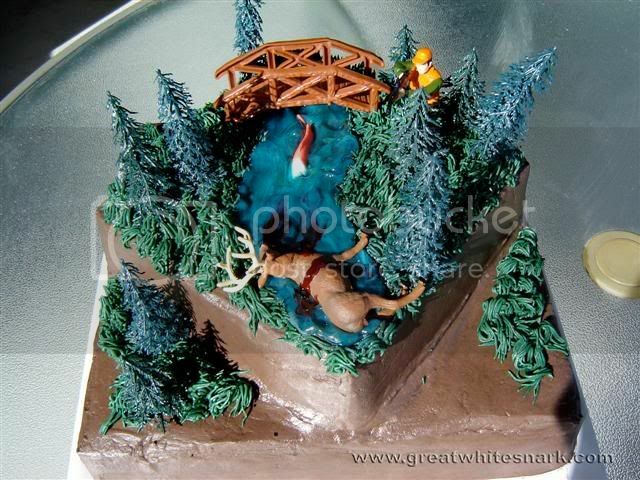 Another groom’s cake she’s made in her side business depicts a hunting scene, “complete with dead deer fallen into a stream and blood trickling” into the water. Perhaps she could mix themes for her next cake and have Greedo bleeding out on the floor of a Tatooine cantina from a Han Solo-inflicted gunshot wound. Just a thought. Thanks to David for sharing the photo and story on this cake! Click on the photo above to visit the original in David’s Flickr photostream. 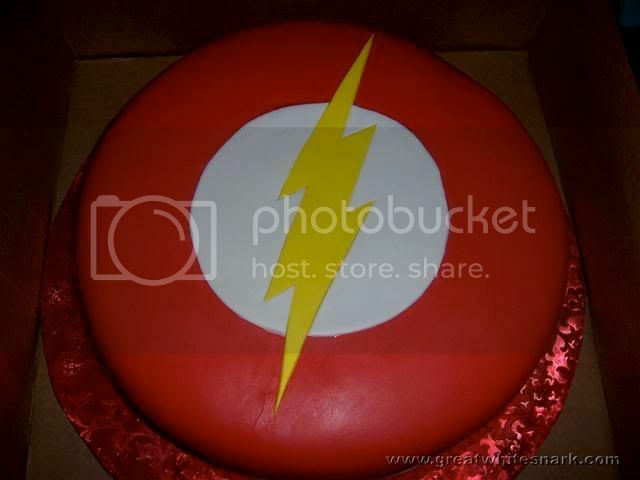 UPDATE: Holly, creator of the R2-D2 cake, has shared a photo of a recently-crafted cake depicting the symbol of The Flash. Ok, that’s badass. I’d marry that broad for a cake like that. Phwew — another cake that’s actually a cake. I was worried, GWS, that we would be subjected to an endless parade of cardboard and duct-tape dressed up as a “cake” rather than actual edible art. And I assume that in this “Bloody Greedo” cake that Han would have shot first? I know you are a purist, after all. I would NEVER make a cake that was not edible! I am make a dinosaur cake tonight…. What a great cake artist Holly is. Why don’t you supply a contact email or phone number in case someone else wants to order one of these. Can they be shipped? That would be tough but I’ll bet a lot of people would like to know. Nice goin’ Holly what an artist! Loren, usually I do link to a cake artisan’s Web site, but Holly actually asked to remain anonymous. I do not have a website, I can be contacted at goodholly at suddenlink dotnet. Unfortunately cakes can not be shipped. You will have to fly me out to Cali to make you a cake Loren! Thanks, Holly… I love a happy ending. my son would just love something like this for his 10th birthday soon. so good.lets see if my wife can make one. Previous post: Reader Poll – How do you feel about Guillermo del Toro directing The Hobbit?